The modern equipped apartment is situated near Sch�nbrunn palace and the city and offers you an optimal starting point for your private or business stay in Vienna. You can park your car free of charge in front of the house. In a few minutes walk you have a great possibilities of shopping and entertainment at the Meidlinger main street .Supermarkets, fruit and vegetable market are just around a corner. From the house are 200 m to the underground U4, U6, and 50 m to the stations for bus 59A or Tram 62, which brings you in 10 minutes to the opera. 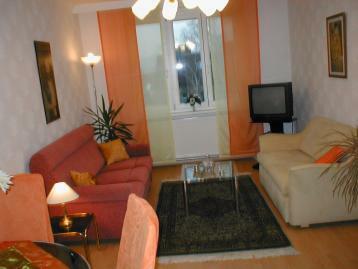 The apartment is comfortably furnished for 2 to 5 persons. It has a anteroom, a separate WC, bath with washing machine, kitchen, storage, living room and bedroom.